SCVHistory.com LW3323 | Beale's Cut | Lobby Card (COPY): Tom Mix in '3 Jumps Ahead,' 1923. 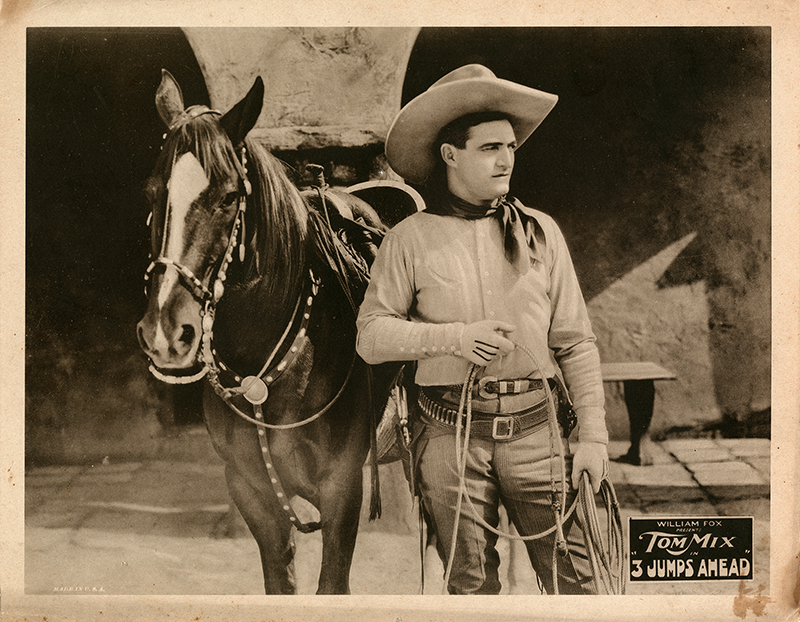 Modern (2018) photograph of a lobby card advertising Tom Mix and his wonderhorse Tony in John Ford's action-packed "3 Jumps Ahead" (Fox Film Corp. 1923) — the movie in which Tom Mix jumped over Beale's Cut. Maybe. Lobby cards from "3 Jumps Ahead" are exceedingly rare. If we find a corresponding original, we'll replace this image. The film no longer exists, so we can't identify the backdrop in the original photograph. All we know is that the movie was filmed at least partially the Newhall area, and one of the locations was Beale's Cut. Apparently the jump was the highlight of the picture. The Watertown (N.Y.) Daily Standard, for instance, says the movie is "one of the most thrilling of the season" and notes that Tom, mounted, "leaps a canyon 20 feet wide and 90 feet deep, undoubtedly the longest and most daring leap ever performed by a screen star." LW3323: 9600 dpi jpeg from copy print purchased 2018 by Leon Worden.